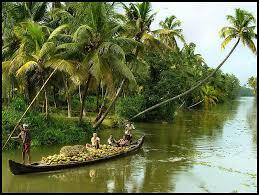 Kerala India Travel Itinerary: This page gives information on India Travel Itineraries. Currently, I have managed to write about my favorite place in India – Kerala. I have been there thrice and wish to travel there again. In my opinion, everyone should travel to India once in their lifetime. It’s an open-air school. It brings out all emotions in you – anger with Beaurocracy, peace in an ashram, compassion of people, joy, sorrow. Watching smiling young faces even though living in poverty can be very uplifting; at the same time, the reality can be very depressing. Generally speaking, I think south India is a better place to visit if you are visiting India for the first time. In my experience, people get friendlier as you go south, there is a rich heritage still preserved in the south. I have found Delhi to be a very harsh place to visit – unfriendly taxi drivers, urbanization, busy life. Day1, day 2 – Cochin – There are plenty of things to do here – Chinese fishing nets, old churches, old settlements and the wonderful food. Day 3 – Alleppey – Take backwaters to ride in a traditional boat, eat on a banana leaf along the way. Don’t forget to visit the ‘Coffee House’ to taste some wonderful Dosas (pancakes) and fresh Coffee. Day 4 – Periyar – A wildlife sanctuary. You can see elephants and other animals during the visit. Day 7,8 – Munnar – Munnar is about 80 km from Thekkady. You can take a taxi to go there from Thekkady. Munnar has some beautiful scenery – acres and acres of tea estates on rolling hills. There is a lake where you can go on a peaceful pedal boat ride. Its an amazingly peaceful place to relax. Another place I like in India is Goa. I’ll write information on more places soon. More Info On- Places to see in Canterbury, Seoul, South Korea Travel Itinerary, Why should you travel?